Army life has it’s share of ups and downs, good times and bad… happy and sad moments. 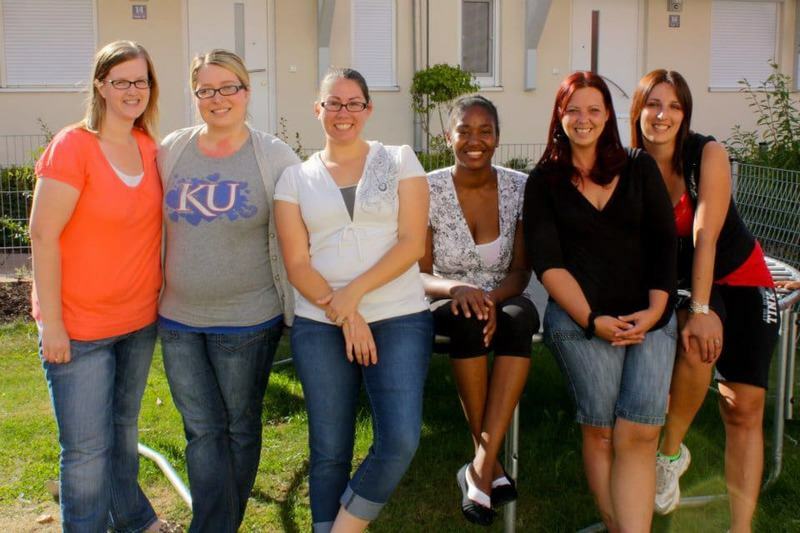 Since moving to Germany over 2 years ago, I’ve had the pleasure of meeting so many amazing new people who have helped in creating the happier of moments. And… luckily enough for me, one person in particular happened to live just out my front door. Dani and I became quick friends… it was hard not to say hello every time I’d come home to see her smiling face in her backyard with her dog Gizmo or her daughter Katie. A nod and a hello turned into us chatting at her fence for an hour which turned into weekend bbq’s and now a great friendship. We also quickly realized that we shared a love of baking and trying new recipes. I don’t know how many times we’ve called each other asking to borrow an egg, or flour, sugar or something we were missing from our kitchen that we needed for that days project. I even made a special cake for her daughter’s birthday party… you may remember this Rainbow Pom Pom Cake. It was a HUGE HIT! This is Dani’s last week in Germany. *sigh* She’s not my first friend to PCS (Permanent Change of Station) back to the USA… but, she’s my second neighbor in 2 weeks to move… and if we’re being honest here… I am not liking it one bit that she’s leaving. Watching everyone around you move away is never easy… and when it’s someone you enjoy spending your time with… it’s even harder. Dani, her husband AJ and their daughter, Katie are coming over for one last dinner together this week and I knew I needed to make something special for them. Since the weather has been so beautiful lately, I knew I wanted to make a cake with bright colors perfect or warm weather. Lemonade… perfect! I was inspired to make this cake from a magazine I picked up last week. I don’t buy many baking or cooking magazines because why pay for it when I have the internet and that’s free. Ha! But this magazine had lots of recipes that I would actually make that looked so so delicious! 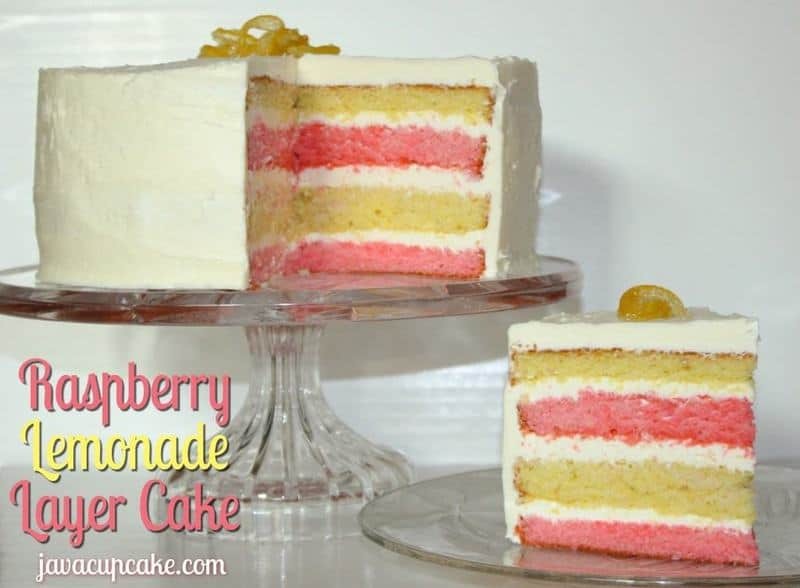 The lemonade layer cake in the magazine was an all pink cake using regular lemonade… so I punched things up a notch and made it a two toned raspberry lemonade cake! YUM! So tomorrow… I’ll share one more evening with my neighbors and treat them to this special cake. Dani… it’s been a pleasure getting to know you and your family! I wish you well for the future and safe travels back to the USA! We’ll miss you! Preheat oven to 350 F degrees. Grease, line with parchment paper and flour 2-9x2in round pans. In a 2 cup measuring cup, combine the lemonade concentrate, milk and extract. Set aside. Using your stand mixer, cream together the butter and sugar for 2 minutes. Add the eggs one at a time and mix well after each addition. Alternately add the flour mixture and milk mixture to the butter mixture, beating on low speed after each addition until just combined. Scoop half the batter into a medium bowl. Gently mix in a small dollop of red food coloring gel and mix until the color is uniform. Repeat with the yellow with the remaining batter. Spread the batter into prepared pans. Bake for 32-35 minutes or until the tops spring back lightly when touched. Allow cakes to cool in pans for 10 minutes before removing to a wire rack to cool completely. Once completely cooled, trim the cakes so that they are the same height using a long, serrated knife. Then, cut each layer in half horizontally creating 4 equal layers. Using a stand mixer, cream the butter for 30 seconds. Add the marshmallow fluff and beat until smooth. Scrape the sides of the bowl. Add the powdered sugar, lemonade concentrate and lemon extract. Mix until combined. Mix in the heavy cream and salt. Beat frosting on high for 30 seconds. Place one pink layer on your serving plate and spread frosting over the top. Put a yellow layer on top of the pink and frost. Repeat again with the pink and yellow layers. Crumb coat the cake and freeze for 15 minutes. Using the remaining frosting on the outside and top of the cake. Use an offset spatula to smooth the sides. This frosting is best served the day it's made. It has a very strong butter taste the longer it sits out. 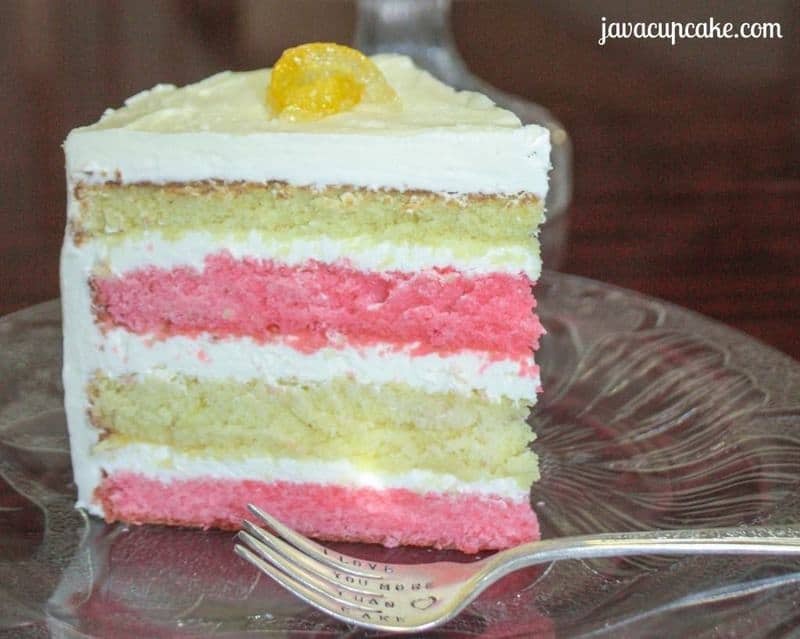 If you don't like a butter frosting - try an American buttercream flavored with lemon. Update: About a week after I posted this cake, my sister made it for her step-daughter (my niece) for her 15th birthday! 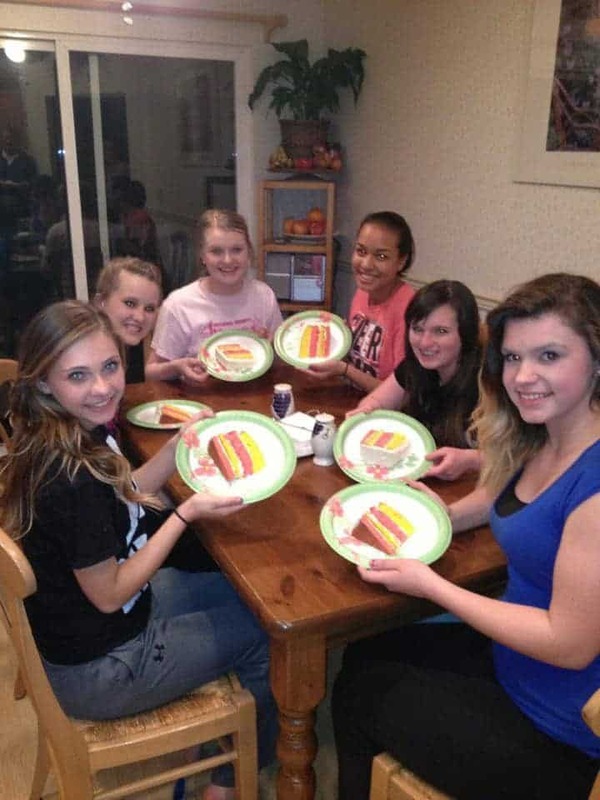 Her is Emily (in the front left in the black) enjoying a slice with her friends! HAPPY BIRTHDAY, EMILY! 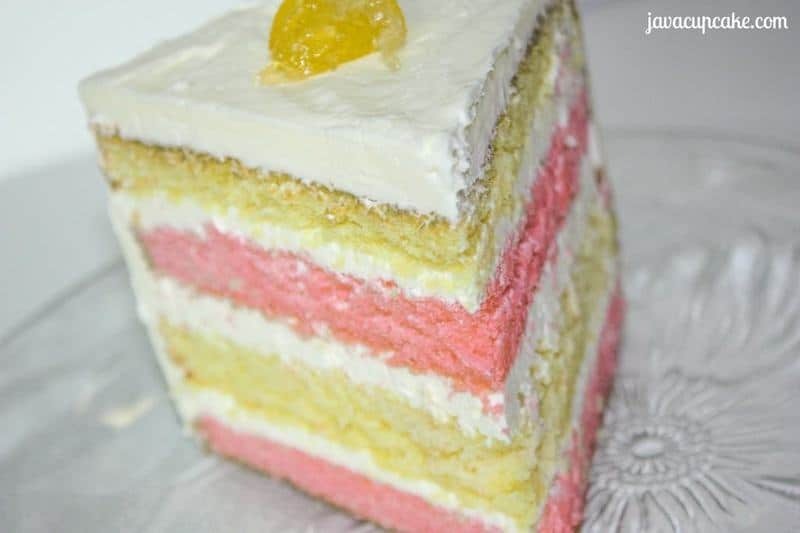 Sidenote: My sister wrote me and said a few things about this cake and why she uses the recipes I post on JavaCupcake. Melted my heart and reminded me of exactly why I have this blog. 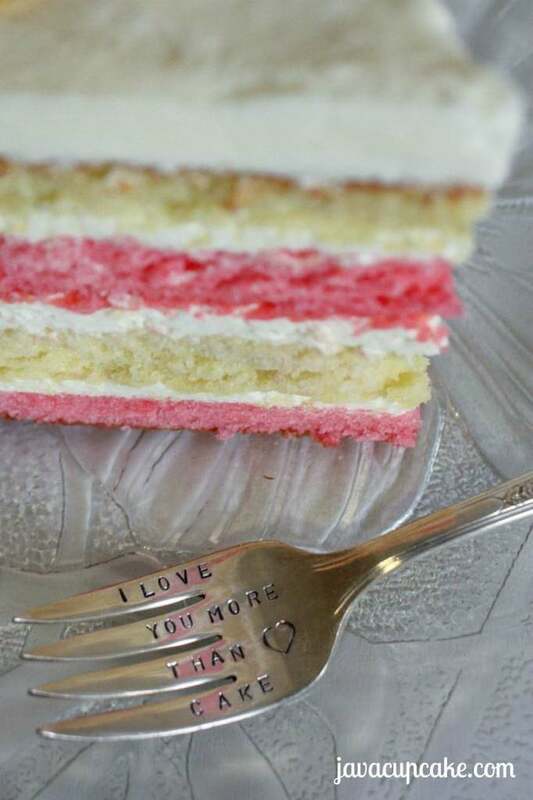 To share love and bring people together through baking. This cake is beautiful! 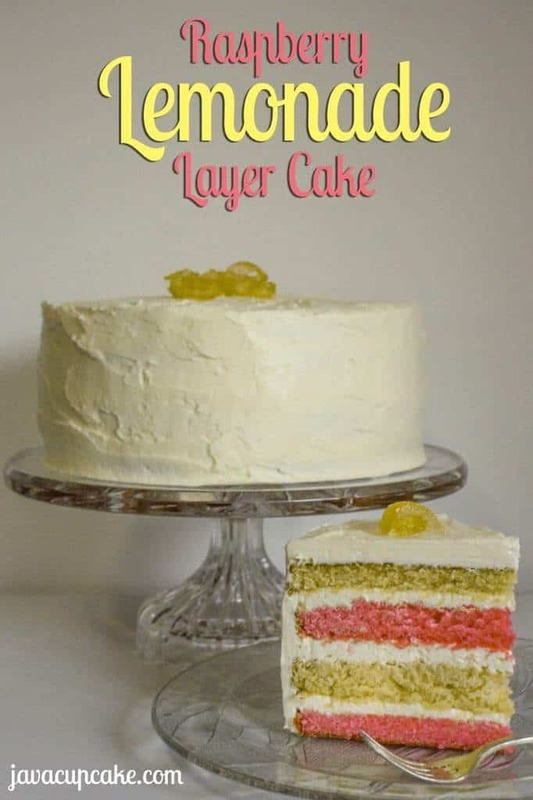 I love those layers! This is a gorgeous cake, and I love the raspberry lemon combo in the beautiful layers. This cake certainly speaks to summer and warmer weather, which I hope that we get soon;) Pinning! What could be better than raspberry and lemon flavour combo? yum! !